This series is about seeing the factors and ideas that promote gender violence, sexual assault,and domestic violence in the comics. As I said in part 1, comics show us our own culture under a magnifying glass. When this happens, the creator pulls out actual problems in our world and holds it in front of our face for everyone to see. One of the masters of this was Charles “Sparky” Shultz, the creator of Lil’Folks or what would become known as Peanuts. The Charlie Brown gang asked the world to accept many things and take a stand on many items in their world. It brought a very grown up world to the kids of the world through the speech balloons and thought balloons of a group of kids. In these pages we learned of racial tension with Franklin, societal corruption with Linus and Lucy, freeway and urban expansion with Snoopy who will lose his dog house, pollution with Charlie Brown, and even gender equality with the only character to be called “Sir”…Ms. Pepermint Patty. It is obvious how didactic comics are, but if this education is seen as “normal” rather than social commentary, we will continue creating and recreating a world of violence and inequality. This is the widely read Non Sequitur by Wiley. The woman in this comic asks her mate to have a conversation. Like most socialized males, he states that there are boundaries on the conversation. Let’s talk about this for a moment: Communication is a very important and pinnacle part of a relationship. Some would argue that it is one of the most important parts of a relationship. What is a known fact is that it is an integral part of a healthy relationship. When two people communicate, they are sharing ideas and sharing a life together. When people put rules on communication, you are censoring someones thoughts and ideas. Any person in a relationship that censors a conversation is exerting a certain amount of power and control. 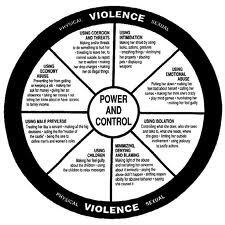 This kind of control is on one of the spokes of the power and control wheel: When a person begins using things off of this wheel, or any like it, they are creating red flags that can and will lead down the road of domestic violence. Let’s continue with our comic. Once he makes his censor (no “stupid and boring topics:decorating and celebrity gossip) the conversation can begin. Not only has the male said that these ideas are stupid and boring, it is obvious that he knows these are the things she wants to talk about. In fact, he just said her ideas and the things she wants to talk about are stupid and boring. This is exactly like saying the real thing…you can spin it however you want, but he just called her stupid and boring. This is verbal abuse. Is this ok? Are we ok with men talking to women like this? Is this an example of a “normal” relationship? Sadly, yes it is. But what Wiley has done is shown us a modern relationship and asked if this is what we want. They have asked if this is what we want our married life to be. Of course it is not. But, what are we doing to change it? The next panels answer this question…nothing. We become disillusioned with our relationships and climb deeper into our holes of loneliness while sitting right next to the person who we are supposedly in a relationship with. A relationship devoid of conversation, niceties, and happiness. In the end we, as the lady does, defines happiness as silence instead of the enjoyment she once felt as a new girlfriend or bride. We must change our view of what a happy relationship is. We must end the idea that a normal relationship is exciting and fun in the beginning but becomes abusive and silent later. Sadly, this is exactly what I’ve heard explained to me by teenagers. Teenagers who are learning from our culture that relationships and everything else is transcendent, so it’s just get what you want out of it and leave. This is the blueprint of an abusive relationship and this is what we are being asked to accept as “normal” in our culture and society! What are you doing to change this view?